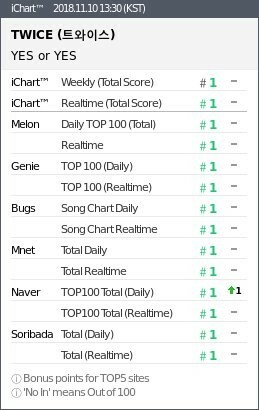 Domestic music charts say 'Yes or Yes' to TWICE's comeback title track with a perfect all-kill! TWICE's 6th mini album comeback title track "Yes or Yes" has taken over domestic music charts, snagging a perfect all-kill in approximately 5 days since release! As of November 10 at 1:30 PM KST, TWICE's "Yes or Yes" is #1 on all 6 major daily and realtime music charts, also scoring 1st place on the iChart's realtime and weekly charts. "Yes or Yes" has managed to dethrone Paul Kim's "Me After You", which topped the charts last week. TWICE should of also achieved a PAK with "what is love" but we all know they got played dirty.. And even than they achieved a CAK.. !! this just proof how strong digitally they are even with all the immense competition they have (IU, EXO, DEAN among others).. Congratulations girls well deserved!! proud to be a ONCE! !